Matty Stevens should play for Posh at Bedford. Photo: Tom Stent. Teenage striker Matty Stevens should make his first Peterborough United appearance in a friendly at Bedford tonight (July 18, 7.30pm kick off). Stevens, who moved from Barnet to the ABAX Stadium, missed Saturday’s (July 16) defeat at the hands of Norwich to attend a family wedding. Gwion Edwards in action for Posh against Norwich. Photo: Joe Dent/theposh.com. 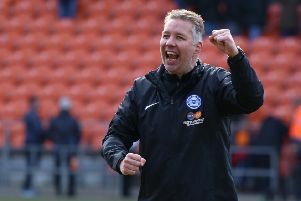 Posh will field a predominantly under 21 side tonight, although senior strikers Aaron Williams and Joe Gormley are expected to play after being left out of the weekend game against the Canaries. Transfer-listed former captain Jack Payne has alsos been included in the Posh squad. They could enjoy themsleves as well as Bedford were beaten 9-0 by League Two side Luton on Saturday. Jack Collison will take charge of Posh tonight. Admission is £7 for adults, £4 for concessions and under 21s, £1 for 10-15-year-olds with under 10s admitted free of charge. The rest of the Posh squad will be in action against a West Ham XI at the ABAX Stadium tomorrow (July 19. 7.30pm). New midfielder Gwion Edwards should play. He came through his first hour of action against Norwich unscathed. “I missed the first two games because of a little niggle,” Edwards explained. “It was nothing serious and I felt fine in the Norwich match. “We matched a team who were in bthe Premier League for an hour and we probably should have taken the lead, but it was a good run-out and it should be the same again against West Ham.